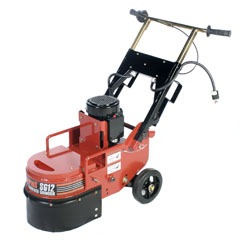 Rent it for $195/day ………………………………………………………..
General’s SG12 electric surface grinder…grinds, scarifies and cleans concrete, asphalt and removes a wide variety of floor coatings. General’s Surface Grinder was designed for the professional contractor, as well as the home owner. With an electric motor that operates on a 15-ampere circuit, it also has a 3-inch diameter vacuum port to help keep airborne dust to a minimum.